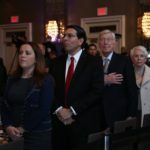 A crowd of over 1200 attended the Zionist Organization of America (ZOA)’s 120th Louis B. Brandeis Award National Dinner on Sunday, November 4, at New York City’s Marriott Marquis Hotel. The night’s truly remarkable roster of VIPs and honorees included National Security Adviser, John Bolton; the US Ambassador to Germany Richard Grenell; TV/Radio Host Mark Levin, Israel’s Ambassador to the United Nations Danny Danon; Harvard Law Professor Emeritus Alan Dershowitz; and actress Suzanne Somers. 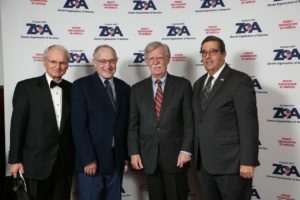 The Gala also honored ZOA president Morton Klein for his 25 years of service as national president of the Zionist Organization of America. The night’s emcee was television news personality and attorney Kimberly Guilfoyle. Israeli Prime Minister Benjamin Netanyahu addressed the Dinner via a videotaped message. 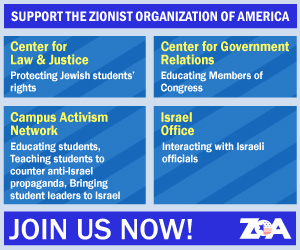 Major ZOA donors provided tables for 175 student activists from various universities and colleges around the country. In launching the night’s proceedings, emcee Kimberly Guilfoyle brought forth cheers from the audience when she referred to Dinner taking place amidst great events –– the moving of the US embassy in Tel Aviv to Jerusalem, Trump Administration moves to defund the United Nations Relief and Works Agency for Palestine Refugees in the Near East (UNRWA), the US withdrawal from the hopelessly tainted and corrupt anti-Israel UN Human Rights Council (UNHRC) and the deportation of the last known Nazi war criminal resident in the US. In his video address to the Dinner, Israeli Prime Minister Benjamin Netanyahu lauded the ZOA for having played a “key role in the fight or a Jewish state” and expressed his “deep appreciation” for the battle the ZOA has waged under Mort Klein’s leadership on behalf of Israel. 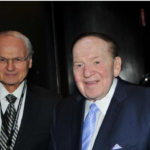 The Prime Minister said, “I congratulate Mort Klein on 25 years of such passion and commitment to your work. The people of Israel and I personally thank you.” The Prime Minister said that the ZOA wages a fearless battle for the truth, no matter how unpopular its message, and never flinched from defending Israel from its detractors. He also declared that the US/Israeli relationship is now closer than ever, with an incredible amount of cooperation at all levels. He also strongly praised The Dr. Miri and Sheldon Award recipient Amb. John Bolton, Shillman Award recipient Amb. Ric Grenell, and Wu Awardee Mark Levin for their principled support of Israel. ZOA Chairmen, Mort Klein (holding award) and Rebecca (Rita) Klein, daughter Rachel, grandchildren, son-in-law David, brother Dr. Sam Klein. Jerusalem Post Deputy Managing Editor and columnist Caroline Glick also paid generous tribute to Mort Klein’s quarter century of leadership in a videotaped message, in which she observed that “from the get-go, Mort Klein has been the one to go to for strong principled support for Israel.” Ms. Glick noted that Mort Klein had often been the only one to truly stand up for Israel when other Jewish organizations were nowhere to be seen and that his dynamism over many years had turned the ZOA into an effective organization that is respected in the halls of government. Sen. Ted Cruz also praised Mort as a “ ferocious defender of Israel” and the ZOA. Danon spoke in some detail of an Israel-bashing session at the UN the previous month involving the anti-Israel organization B’tselem, which he described as “a joke of a human rights organization which sides with our enemies, telling lies about the IDF, the Israel government and Israel’s Supreme Court. Shame on them. Danon said we are now winning in the UN, we have relations with 160 countries and are working closely with countries around the world. Mort Klein commenced by expressing what a tremendous honor it was have led the ZOA for 25 years, quipping that “Before you give me credit for that, I want you to know that the only reason I stayed so long because I couldn’t find another job. I’ve been looking.” Mort spoke of the ZOA, the oldest pro-Israel organization in America which last year celebrated 120 years, and the incredibly important role it had played at vital points in the history of Zionism and Israel, noting that his predecessor as head of the ZOA Supreme Court Justice Louis D. Brandeis had always championed the view that support for Zionism was entirely consistent with strong American patriotism “while anti-Semites and frightened Jews were screaming that Zionist Jews were guilty of dual loyalty.” Klein recounted Brandeis’ vital role in the annals of Zionism in approaching President Woodrow Wilson and persuading him to support the 1917 Balfour Declaration. Klein observed that, it is likely that Britain would not have issued the Balfour Declaration without the support and encouragement of the US President that Brandeis has secured, enabling the eventual creation of the Jewish State of Israel that we have today. Pres. Wilson sent a letter to ZOA on this issue. Referring to the ZOA’s leading role in campaigning in opposition to President Obama’s disastrous Iran nuclear deal, Klein recounted how the ZOA had helped organize the rally on Capitol Hill at which the leading Republican presidential candidates at the time –– Donald Trump and Ted Cruz –– and talk show host Mark Levin, whom the ZOA was honoring on this occasion, had spoken eloquently in opposition to the unfolding deal. Among other ZOA achievements noted by Klein was the ZOA’s success, by its persistent lobbying and media campaign, in prevailing upon New York’s Metropolitan Opera not to broadcast the anti-Semitic opera, John Adam’s Death of Klinghoffer, thus preventing it from being broadcast worldwide to millions of listeners. Klein also recounted the successful efforts of the ZOA’s Law and Justice division headed by Susan Tuchman in getting Title VI of the Civil Rights Act, which protects students from discrimination on university campuses, to apply the same safeguards to Jewish students threatened by anti-Semitic harassment, intimidation and discrimination by vicious anti-Israel groups on campus. Klein also noted the vital contribution of the ZOA’s Government Relations department, staffed by Dan Pollak and Josh London, who work to explain the truth of the Arab war on Israel to legislators and their staffers on Capitol Hill. “Yes, the Arab war on Israel,” said Klein emphatically. “There is no Arab/Israel conflict. The Palestinian Arabs have have been offered many times a Palestinian Arab state alongside Israel. The is an Arab war against Israel’s existence. Our Campus Department and ZOA ‘s young professionals Fuel for Truth group helps to train young professionals how to advocate for Israel and answers the propaganda lies about Israel told by of some of the Arab and anti-Semitic Israel haters. Klein also reminded his audience of the ZOA’s repeated, successful efforts in opposing the appointments to high office of virulent anti-Israel figures who might have harmed Israel or been in a position to advance their anti-Israel agendas, including at the highest levels of government. Klein referred to John Roth, who would have been appointed head of research at the US Holocaust Museum; Joseph Zogby, “who condemned Israel relentlessly as a monster and worse,” appointed adviser to then-National Security Council Middle East Adviser Martin Indyk, who resigned after three weeks following a ZOA campaign highlighting his terrible anti-Israel record; Chas Freeman, who blames US support for Israel for the 9/11 Al Qaeda terrorist attacks and, but for ZOA action, would have headed the National Intelligence Directorate under President Obama and who, in an interview on CNN’s Fareed Zakaria’s program, singled out the ZOA for mounting a campaign that had prevented him taking up his position; and Salam Al-Marayati, who would have been appointed to the National Commission on Terrorism, but for the ZOA’s campaign alerting Congress to his rancid anti-Americanism, Holocaust denial and support for terrorist groups and for Israel’s destruction. Klein also noted that it was the ZOA’s campaigning alone that had prevented the anti-Israel Strobe Talbot, who was on record saying that America should treat Israel like Iraq, from eventually becoming Secretary of State. Klein then changed subject, making an emotional, moving appeal for unity of the Jewish people, in the wake of the horrific massacre of eleven Jews in a Pittsburg synagogue. Klein observed that “Despite our achievements and the work of other Jewish groups, the scourge of anti-Semitism is still with us. I am the child of Holocaust survivors, born in a Displaced Persons camp in Germany. I lost most of my family, including three of my grandparents, to Hitler’s Holocaust. I know first-hand the consequences of unbridled, virulent Jew hatred. The horrific massacre, the murder of eleven beautiful, innocent Jews at a Pittsburgh shul by an evil monster who hates President Trump and he said he hates President Trump because of all the ‘kikes’ around him, all the Jews around him. How can we as Jews and decent people try to minimize the likelihood of such nightmares to occur? First, we Jews have to realize that anti-Semites do not care about the level of any Jew’s religious observance. They don’t care if you’re Orthodox, or Conservative, or Reform or Reconstructionist or an atheist Jew. They don’t care about your political views, whether you are a Republican or a Democrat, rich or poor or educated or not. The anti-Semites hate every Jewish man, woman and child. We Jews have to realize that we are all in this together. We must unconditionally love, support and respect one another, no matter what our differences are. All Jews, whether they be Orthodox, Conservative, Reform, Reconstructionist or atheist, are all 100% Jewish. That’s what the Torah teaches us. These murderous acts may start with the Jews but, as I tell non-Jewish friends, it never ends with the Jews. Thank G-d, President Trump understands this,” as he made clear in his heartfelt statement recognizing this attack as an assault on all Americans, speaking of the necessity of standing with our Jewish brothers and sisters, and that we will seek the destruction of those who seek the Jews’ destruction. Klein continued, “As Israeli Ambassador Ron Dermer said, never has a non-Israeli leader ever made such powerful and forthright statement of support as President Trump did. Klein also noted that there is far too much tolerance of the anti-Semitic black supremacist hater, Louis Farrakhan, who recently called Jews “termites,” yet former Presidents Clinton and Obama have been photographed with him, while some members of Congress associate with and share platforms with him. The ZOA had also called for the sacking by Fox of Geraldo Rivera, who has made outrageous statements of support for arch-terrorist Yasser Arafat and his waging a terrorist war and dispatching suicide bombers into Israel, killing over 1500 Israelis and wounding and maiming thousands more. We must condemn every significant anti-Semitic act and Israel hating act and ostracize every anti-Semite and Israel hater. There must be severe consequences to this hatred. Jewish leaders, political leaders, faith leaders, university leaders, media leaders must relentlessly condemn anti-Semitic hatred. Following Klein, actress Susan Sommers introduced the US Ambassador to Germany, Richard Grenell, the recipient of the Dr. Bob Shillman Award for Outstanding Diplomacy, who recounted that he has been fighting a pitched battle with German companies to conform to the sanctions regime the US has imposed on Iran following the US withdrawal from the 2015 Vienna nuclear agreement. Ambassador Grenell noted that he would shortly be returning to Germany in time for the national observance of the 80th anniversary of Kristallnacht. He spoke of the German reluctance to go along with the US sanctions although in the long run most German companies would do so, rather than risking their international viability and status by continuing to do business with Iran in defiance of US sanctions. Ambassador Grenell said that the strategy adopted by Secretary of State Mike Pompeo and National Security Adviser John Bolton was the right one, because it was placing maximum pressure on Tehran to relinquish its nuclear weapons program or else face economic devastation. Ambassador Grenell also gave a spirited defense of President Trump’s policy, emphasizing that the President had come through on the things he had promised, like withdrawing from the Iran nuclear deal, relocating the US embassy to Jerusalem and supporting our allies while calling out our enemies. He also spoke of his successfully making Germany accept a Nazi that the US was deporting. He also praised the ZOA for “its role in being a leading defender of Israel” at a time when anti-Zionist groups were so strong and active. Television and radio talk show host Mark Levin, the recipient of the ZOA’s Wu Kai Sheng Outstanding Journalism Award, spoke last, giving a powerful speech in which noted the strength and extent of support for Israel in today’s Republican party. Mr. Levin enumerated the many pro-Israel acts of President Trump’s Administration, noting that President Trump had effectively reversed the damage done by President Obama in permitting the UN Security Council to pass a resolution in December 2016 stating that all of Judea/Samaria, including the eastern half of Jerusalem, was occupied Palestinian land and denying Jewish rights and connection with these territories that are actually the Biblical and historic home of the Jewish people. Noting other decisions by President Trump –– withdrawing from the terrible Iran nuclear deal; the closure of the PLO’s Office in Washington, thereby holding the PLO accountable for the absence of any effort on its part to negotiate peace with Israel, rather than inflaming the conflict internationally, as the PLO Office had been doing; the subsequent denial of visa to PA representative Husam Zumlot at the PLO Office; the appointment to Israel of David Friedman as ambassador, whom Levin described as “the best ever, pro-Israel ambassador to be appointed”; cutting US aid to the PA and contributions to UNRWA, and so on –– Mr. Levin challenged doubters to examine the Trump record in detail and compare it to that of President Obama in determining who was truly a friend of Israel. Mr. Levin also emphasized the power and sincerity of President Trump’s words after the massacre of Jews in the Pittsburgh shul and condemned as “ridiculous” the assertions being made about President Trump being anti-Semitic or in some way responsible for the massacre. He strongly condemned the Jewish leaders, many of them not even from Pittsburgh, who had opposed President Trump visiting the site of the massacre. Mr. Levin said it was a tragedy that so few Jews support President Trump. 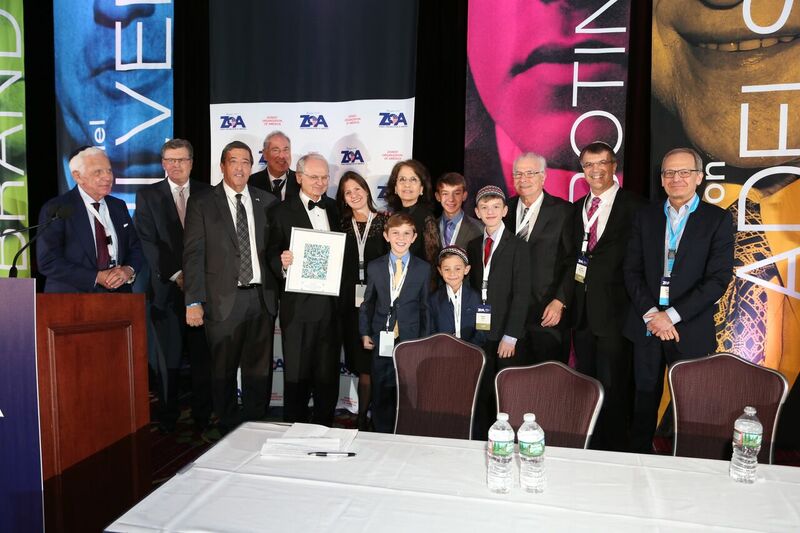 ZOA Chair Mark Levenson presented Mort Klein with ZOA’s Theodore Herzl Award for 25 years of outstanding Service to the Zionist Organization of America. He then called Mort’s wife Rebecca (Rita), who has shared over 40 years of life with Mort, to the stage along with Daughter Rachael, husband David and grandchildren Elijah, Isaac, Levi and Micah who flew in from Phoenix. Mort’s Brother, Dr. Samuel Klein, Danforth Professor of Medicine, and Chair of the Center for Human Nutrition and Georontology, at Washington University, St. Louis, joined them on the stage. A tribute was mentioned of Mort’s 96 year old Holocaust survivor mother as well. ZOA Board Member Cliff Rieders delivered the Dvar Torah, and Board Member Shira Lewis recited the blessing over the bread. In his speech, Klein also paid tribute for the survival and flourishing of ZOA today to ZOA stalwarts Dr. Michael Goldblatt, Michael Orbach, Alan Mazurek, Ed Siegel, Henry Schwartz, Lowell Milken, Silvia and Carl Freyer, Sheldon and Miriam Adelson, Irving and Cherna Moskowitz and “many many more” that have made the ZOA’s work possible. Mort also thanked those who had “worked so, so hard, day and night, for months” to make this year’s Dinner a success –– Executive Director John Rosen, Howard Katzoff, Nancy Hollander, Jackie Schaffer, Rachel Glaser, Enid Roman, and Kathy Branch.